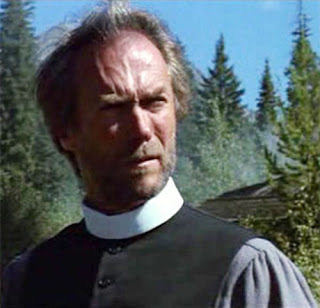 Most people don’t think of churches or religion when they think of Eastwood films, but issues of religion, faith, and churches come up a lot in his films. Perhaps his greatest film, Unforgiven, wrestles with great moral issues of righteousness, judgement, and the worth of a human life. Eastwood grew up going to Protestant churches until he was twelve, but doesn’t appear to have gone much since. He hasn’t been very public about his religious views, and it’s hard to guess his view of organized religion from his movies. You find good clergy and bad, churches that are helpful and some that are -- not so much. It says something, though, that in the worlds Eastwood creates as an actor (and even more as a director), the church is a part of it. Even in a very cartoonish film, The Gauntlet, about a cop transporting a witness wanted by the mob (directed by and starring Eastwood), religious elements keep popping up. You can see by this poster it’s not exactly a serious Bergman like drama. The film opens and closes with a jazz rendition of a hymn, “Just a Closer Walk with Thee.” When Shockley the cop (played by Eastwood) asks for rental car, he asks for it to be dropped off at “The Christian Center” in Las Vegas. (That car is sabotaged with a bomb.) Shockley holes up in a house expecting help from his fellow cops, but the cops shoot the house up. A sign outside the house reads, “God Makes House Calls.” At another point in the film, when there’s an ambush at the Arizona border, “God Gives Eternal Life” is on a sign. Obviously, these are sly winks at the audience. But is the filmmaker ironically implying that God doesn’t care, or is he suggesting that Shockley’s survival is truly miraculous? 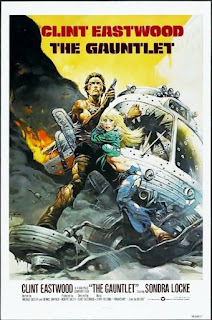 So look for the first Clint Eastwood Movie Church to be posted tomorrow.